It is HOTT outside! It rarely gets all humid and sticky like it does out east, but right now Vancouver is going through a little heatwave and I’m not used to all this humidity. Cooking just isn’t an option. Yesterday we were invited to a bbq and I decided to whip up a salad. Unfortunately, I wasn’t very inspired to make anything new (I blame the heat), but somehow after checking out what the local market had out for sale, I knew I couldn’t let all that natual goodness go to waste. Armed with green beans, fresh corn on the cob, cucumbers, parsley and other yummy vegetables, I whipped up a salad that is the epitomy of summer in a bowl. Colourful, crisp, fresh and healthy, this salad was a delicious barbeque accompaniment and I’ll definitely be making this again. The key to this salad is to keep everything bite-sized. 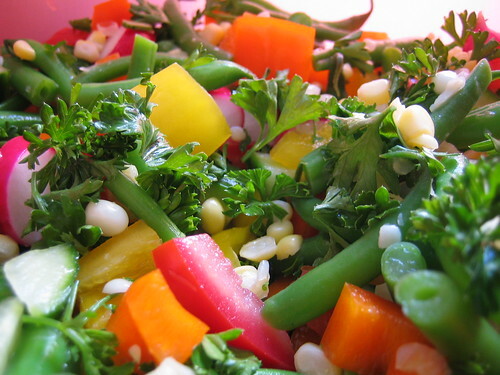 Not only does it make the salad look extra pretty, but it makes for a tastier mouthful! 1. Bring a pot of salted water to a boil. Add green beans. Blanch until bright green and tender-crisp, about 1 minute. Drain and add to ice water to cool. Place green beans into bowl. With a sharp knife, remove the kernels from the corn cob and blanch for 2 minutes in salted water. Drain and cool. Add corn to bowl. Add remaining vegetables and parsley and mix. 2. Make dressing. Combine lemon juice, honey, vinegar, olive oil, and salt and pepper. Mix until thickened. 3. Toss dressing into salad and serve immediately. Yum! Green beans are so good this time of year. it really was, crystal! i couldn’t believe just how colourful it all was. i agree, rachel! i can’t get enough of all the green beans. i think they’re my favorite vegetable. this looks so good! I want it right now! That looks so amazing. I should go out and pick some green beans right now! Thanks for the recipe. as summer draws to a close, i’m searching for ways to savor summer flavors – this looks fresh & delicious! cider vinegar + radishes = count me in.